Oh don't get me goin'. Because I will get goin' about this weather. It's cold, it's wet, and it's rainy. It's rough out there. Above photo? My bean plant died. Too much cold and too much wet. It's what beans can do when it's just too cold and wet. Want some great insight from our local OSU Extension Horticulturist? I spoke with Weston Miller on my most recent LeLo Homemade show, and we chatted about what short and long term effects this chilly weather is having on our gardens. 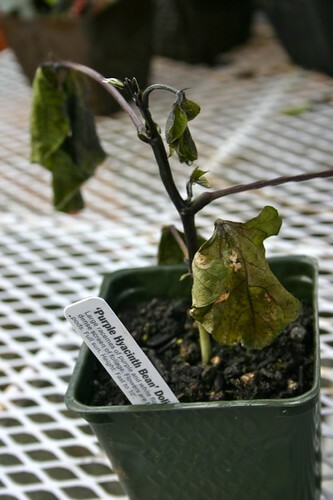 Read my lips: powdery mildew will be a problem. And then I rambled on all about rhubarb: where it came from, how to grow it, and my favorite things to do with rhubarb. Did you know "rhubarb" is the word they say on stage when actors are portraying a surly crowd? Rhubarb, rhubarb, rhubarb. I guess it is kind of surly sounding. And bonus! You can subscribe to my show on iTunes now if you like, too. How are other Pacific Northwest gardeners holding up with this weather? And for the rest of you, if you tell me you've been enjoying 90 degrees and days by the pool I'll about slap you upside the head. I'm pretty sure I've killed two different bell pepper plants already, and three cucumber plants are long gone. But considering this is my first attempt at gardening, I'll consider the success I'm having with tomatoes, strawberries, lettuce and zucchini a win. Live and learn, right. And curse the weather gods. Kim, you're not the only one to have killed multiple cucumbers so far this year. I just forget to mention it. Ahem. I'm having gardening woes too....been tough to grow cucumbers and tomatoes. I hope I can replant one more time before July! Thank god it's not just me and a brown thumb. I have my first house garden and with my only point of reference being the garden my dad planted when I was 9 (that I stole all the cherry tomatoes and strawberries out of and blamed crows) the learning curve seems steeper in a wacky weather year. So how hot should it be before I venture back to replant cukes and beans? The basil is mushy looking, all varieties. The tomatoes have black edges on their droopy leaves. Nothing in the garden is really growing.....except oregano. Sigh! Ummm, 95 degrees with damn Kansas humidity and massive thunderstorms each afternoon - you know, you've spent summers here! Raspsgirl-I hear you about the cucumbers. Our tomatoes are requesting lap blankets. But the cherry tomatoes do have some green fruit on them. Yeah! Jen D.-You can try again with bean seeds. It looks like we might get a little sunshine this weekend? Oy. Lisa-I knew better than to plant my basil but yes, I did, and yes, they are looking mushy. For the love of a hot summer day and a caprese salad! Is that too much to ask?! Heather-You are making me remember....hot days at the Sabetha pool were the best. Are the fireflies out yet?